The popular Naze32 is here! 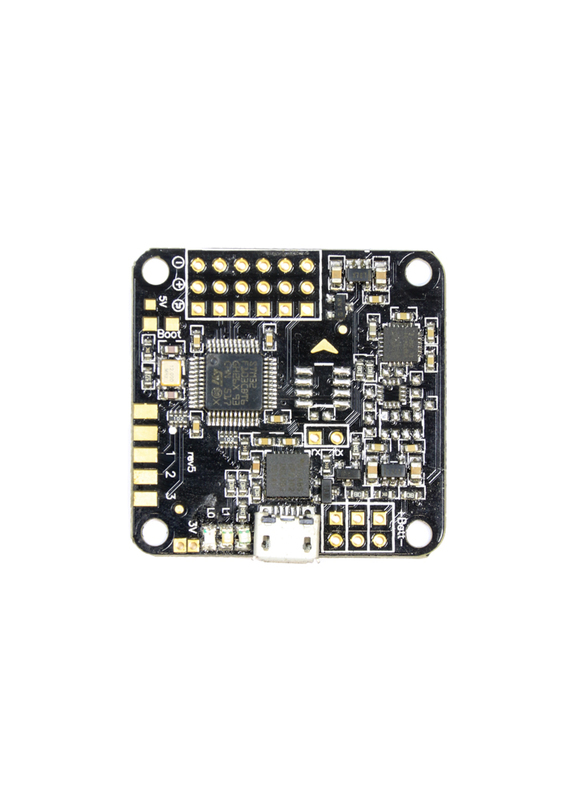 Initially designed for use with small to mid-sized multirotor craft, it has become the go-to controller for a host of Multirotor projects and propheads. At the heart of the Naze32 is a 32bit ST micro work horse of a processer, with untapped memory and cpu power and a host of equally impressive sensors. The Naze is also matched up with some of the nicest GUI programs and features to get the most out of your configuration. The Naze32 comes as the most complete Acro Version yet, with both strait and 90deg pins for your preference and a matched break out harness. Up to 8 ch RC input - supports standard receivers (PWM), PPM Sum receiver (FrSky, etc), or Spektrum satellite receivers. 32-bit processor running at 3.3V/72MHz (STM32F103CB). What do I need to know about flight controllers? 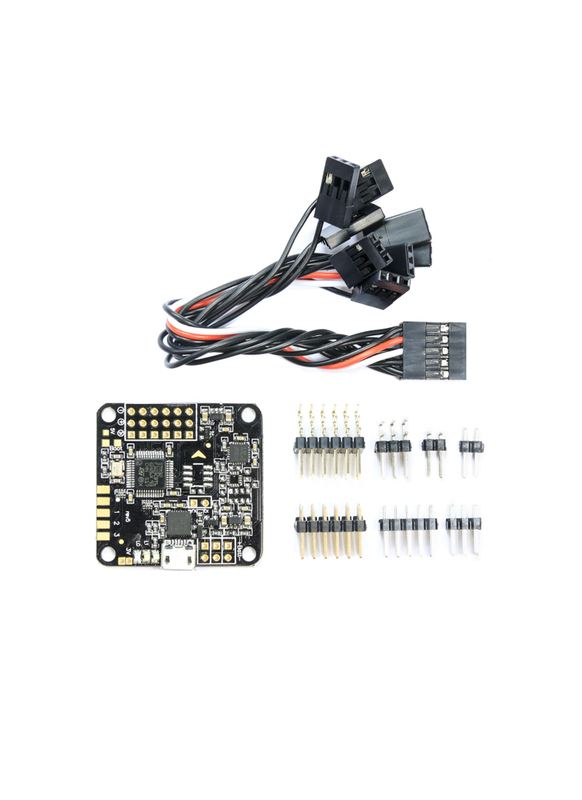 You should think of the flight controller (FC) as the brain of your multi rotor UAV. Its principal roll is to stabilised your craft, some more sophisticated flight controllers can also fly your drone autonomously. In order to keep the drone perfectly balanced the FC takes continuous measurements from the Inertial Measurement Unit (IMU). These are electronic sensor devices such as a gyro, accelerometer, compass or GPS that measures the velocity, orientation and gravitational forces of the multi rotor. Based on their signals and command inputs from the pilot, the FC processes the data using complex algorithms and makes adjustments to the speed of each rotor to keep the craft level. A multi rotor has four controllable degrees of freedom: Yaw, Roll, Pitch, and Altitude. Each degree of freedom can be controlled by adjusting the thrusts of each rotor. When it comes to selecting a FC, there is a lot of choice. Some of the notable ones are the KK, MultiWii, Ardupilot, Naza, Rabbit and WKM. Your choice of FC is mainly dependent on what you want and your budget. Advanced FCs generally have more features and sophisticated sensors like gyro, accelerometer, sonar, GPS, Magnetometer. Some flight controllers include the IMU and some don’t. Different FC will have different flying capabilities. The following list states the main ones. Gyro Stabilization - the ability to easily keep the multi rotor stable and level under the pilot’s control. This is a standard feature of all flight control boards. Self Leveling - the ability to let go of the pitch and roll stick on the transmitter and have the copter stay level. Care Free - The pilot can control the drone as if it is pointing in its original direction as the orientation of the copter changes. Altitude Hold - the ability to hover a certain distance from the ground without having to manually adjust the throttle. Position Hold - the ability to hover at a specific location. Return Home - the ability to automatically return to the point where the copter initially took off. Waypoint Navigation - the ability to set specific points on a map that copter will follow as part of a flight plan. You should also consider the quality of the components, software package and importantly extent of support, both official and community based. Then there is the question of compatibility with peripheral accessories. The more advanced systems can communicate with a ground station via a telemetry link, allowing the pilot to program an autonomous flight and track progress remotely. Finally there is cost, prices range from £20 for some of the most basic FCs to over £1000 for the most sophisticated, such as the DJI Wooking.